We thought this one was going to be cut-and-dried. We thought Krys Barch said something hateful and racist and unacceptable to P.K. Subban, and the NHL would come down with all its disciplinary might to show that there's no place for racism in hockey, and then we'd all move on. Naturally, nothing's that easy. 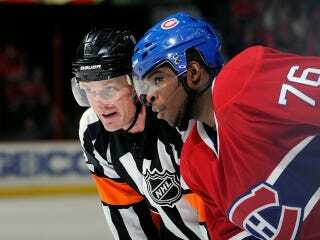 Last week, Florida enforcer Barch was ejected for saying something to Montreal's Subban, who is Jamaican-Canadian. The Miami Herald reported that a linesman had overheard Barch use a "racial slur" after Subban had mixed it up with another Panthers player. We don't know many different racial slurs, and unless Barch went to the George Allen School Of Racist Things Old People Say, we assumed he used a certain n-word, and no suspension could be long enough after the FA suspended Luis Suarez eight matches. Apologies to Barch for assuming anything, because that's not what happened at all. It's reported today that Barch asked Subban if he "slipped on a banana peel," after Subban hit the ice to end a scrap with Erik Gudbranson. He received a one-game suspension, the Goldilocks of suspensions: some think it's too harsh, some think it's not enough, and not even the league was sure how to handle it. It would have been easier for everybody (except Barch and Subban) if he had just dropped the n-bomb. Was the banana crack even racist at all? It depends on who's using it and how.Puck Daddy reports that it's a common quip when a guy "slips" to avoid fighting. On the other hand, banana and monkey references are go-to race bombs in Europe and to a lesser Canada, where both Barch and Subban hail from, and where black players Wayne Simmonds and Kevin Weekes have had bananas hurled at them in recent years. Things are even more muddied in Montreal, where the Habs apologized to the city for hiring an anglophone coach and where fans once showed their support for Subban by wearing blackface. So, racist or not? There's a compelling argument to be made on both sides, but without any more context, you can't legislate thoughtcrime. That's why a token one game suspension is the perfect punishment for Barch, even if his game check is being sacrificed as a warning to others. The NHL is saying, "we don't know if this was racist. But there's too much of a banana history in racism to ignore it. So, from here out, please don't make any banana references when talking to black players. It'll just cause trouble, and we'd rather not have to deal with it." Now there's a precedent, so intent won't even have to come into play next time. Don't go bananas on the ice.